Here is an article from the AMD 50x15 foundation newsletter. Dan Shine and Daniel Hanrahan and their team generously donated an OLPC XO Laptop to me during my trip to America. I brought it to my former primary school where my sisters still attend. Since then, OLPC's chairman Nicholas Negroponte has been kind enough to provide some more which I plan to permanently install at the school. Students at the Wimbe Primary School, Malawi, are fascinated by OLPC’s XO Laptop, which was shown to local school alumnus William Kamkwamba. 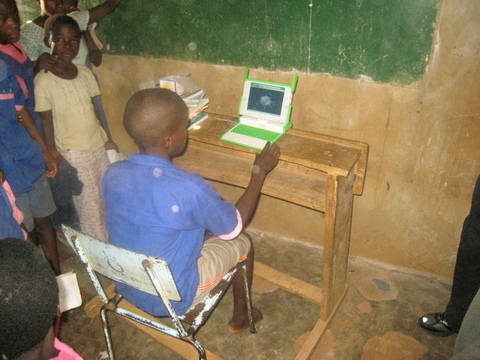 A student from Wimbe Primary School, Malawi, learns to type and correct his spelling on the XO laptop. 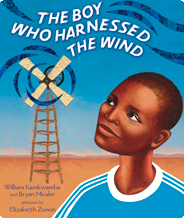 Six years ago, when William Kamkwamba happened upon a photograph of a windmill and decided to build one to power the family home, he never imagined he’d become an international inspiration. Using blue gum trees and spare bicycle parts, the unlikely advocate for wind power from Malawi, S. Africa, built three windmills in his yard, turning a small dream of powering appliances in his home into an energy source that could someday provide power to an entire country. Kamkwamba, whose drive and ingenuity were covered by The Wall Street Journal, was invited onstage last June at the Technology, Entertainment and Design (TEDGlobal) conference in Arusha, Tanzania. He told his story. And after the conference, a group of entrepreneurs, African bloggers and venture capitalists pledged to finance his education. Also inspired by his story, Dan Shine, Vice President, 50x15, along with Rebecca Gonzales, OLPC Relationship Manager at AMD, presented Mr. Kamkwamba with the latest XO Laptop at Consumer Electronics Show (CES) in Las Vegas this January. We contacted Kamkwamba recently to ask about his experience with the OLPC device. 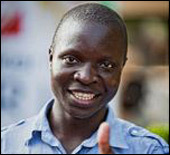 Kamkwamba recently took the XO Laptop to his former primary school in Malawai. The reaction from students was one of excitement and wonder. While the students had heard about computers, most had never seen one up close, let alone used one. It didn’t take long for the students to learn how to use the XO. They typed, played music and used the laptop’s built-in camera. Those involved with 50x15 know the power of computers and their impact on young students. When computing devices were introduced to 10th graders at a 50x15 Learning Lab in the Diepsloot School, S. Africa, attrition of 8th and 9th graders dropped by 50 percent. Not surprisingly, the XO Laptop Kamkwamba showed students in Malawi has produced similar interest. “I heard one of the teachers say that the kids are going to school daily as they believe I will visit with my (XO) laptop,” Kamkwamba said. AMD forges ahead with the 50x15 goal of providing Internet access and computing devices such as OLPC’s XO laptop to remote locations throughout the world. Whether or not the power windmills are used to provide power to the devices remains to be seen.